Furukawa Electric and AusOptic are proud to introduce the FITEL S185 Advanced Fusion Splicer Series. Designed for the needs of Optical Equipment Manufacturing (OEM) and production lines which have increasing demand for specialised fiber splicing. For example, polarisation maintaining fiber in high speed optical communication, optical sensors, and large diameter fibres for the construction and maintenance of fiber lasers. The new S185 Fusion Splicer Series prioritises the functions most critical to manufacturing applications, and removes unnecessary features to achieve a more compact, cost-effective, and efficient splicer. Ideal for use in production lines and with specialised fibers including Polarization-Maintaining Fiber (PM Fiber) and Large-Diameter Fiber (LDF). While mainstream multi-function splicers can be suitable for R&D applications, they have not satisfied current manufacturing applications which require greater production efficiency. FITEL Advanced Fusion Splicers continue to succeed where conventional fusion splicers prove unwieldy, expensive, and unsuitable for these applications. Key attributes include easy and safe operation, high speed splicing and heating, durability and stable performance for heavy use, and very low splice loss for splicing dissimilar fibers. The first to launch is the S185PM, expected in February 2019. The S185HS and S185LDF will follow in March 2019, and the S185PMLDF is projected for launch in June 2019. The FITEL S185 Fusion Splicer series was first displayed at the 2019 Photonics West Show in the OFS Booth (1559) and at 3SAE Technologies, Inc. booth (4985). The event aims at raising awareness on fibre-optic sensing applications with hardware and services suppliers, researchers and industries. Coupled with the proliferation of fibre-optic cables has become an increased level of interest in their use as sensors. With the employment of appropriate hardware, cables can be used for both temperature and vibration monitoring. The team from AusOptic will be present to demonstrate sensing systems and technologies by Luna, MH GoPower, NorthLab, and YOFC. Subjects include exploring HD FOS (high-definition fiber optic sensing) capabilities, test methodologies and real-world applications. The Luna OBR 4600 is part of Luna’s award winning Optical Backscatter Reflectometer product line. Designed for component and short-run network testing and troubleshooting, the OBR 4600 enables ultra-high resolution reflectometry with backscatter-level sensitivity. With spatial resolution as fine as 10 microns, zero dead-zone, options for integrated temperature and strain sensing and extended device mode, the OBR 4600 offers unparalleled fiber diagnostics. MH GoPower’s PoF sensing system that uses optical fibres to deliver power to traditional sensors. The idea of PoF is using optical power through optical fibres and converting it back to electrical power with the help of PV converters. As optical fibres are metal free, this setup can be used in the presence of strong magnetic fields (medical applications – tomography) or where electrical signals are undesirable (including mining and sensing). The NORIA is the world’s first commercially available lithography system for fabricating Fiber Bragg Gratings (FBGs). Fast and easy to use, it offers end-users flexibility in writing a large variety of grating types. A Deep Ultra Violet laser (Coherent Excistar XS 500Hz—ArF) and a phase mask (Ibsen Photonics) are used to transfer a periodic pattern into the core of a photosensitive optical fiber. YOFC’s samples of various optical fibres and fibre Bragg gratings for sensing, as well as design and manufacture of customised specialty fibre and cables. A Masterclass on Fibre-optic sensing by Dr. Arthur Hartog. Arthur’s research led to the first demonstration of a distributed optical fibre sensor in 1982. Since then he has continued to work on optical sensing and was responsible for the first Raman distributed temperature system. Arthur is the author of the acclaimed book “An introduction to distributed optical fibre sensors”. Presentations from industry and academia detailing the application of fibre-optic sensing in fields such as oil & gas exploration and production monitoring, pipeline monitoring, security systems, and road and rail monitoring. Practical demonstrations conducted at Curtin University’s dedicated field laboratory. Geologists, geophysicists, and engineers eager to learn about this relatively new sensing technology. Registration fee includes all meals and refreshments. Location: The workshop will be conducted at the Australian Resources Research Centre in Perth Western Australia. VIAVI Solutions introduces new, all-in-one optical test platform with integrated, dual-bay solution automates and speeds fiber/optical test and certification. VIAVI today announces the release of its new T-BERD/MTS-4000 V2 Optical Test Platform. A modular test platform designed for the installation, turn-up and maintenance of fiber optic networks. The T-BERD/MTS-4000 V2 is a small, compact handheld test platform designed for all phases of the optic network lifecycle. The newly streamlined form factor supports the full range of VIAVI fiber analysis tools including OSA, OTDR, bidirectional insertion loss/ORL, light source, power meter, and connector inspection. It offers engineers, technicians, installers and contractors the highest performance and superior levels of scalability and upgradeability. This new field tester supports the full network lifecycle through construction, activation, maintenance and troubleshooting with applications for FTTH/PON, CWDM & DWDM, DAS, C-RAN, 5G, Enterprise & Data Center (Tier 2 – OTDR & MPO switch), Access and Metro Core (10G, 40G, 100G – OTDR & C-OSA). For more information on T-BERD/MTS-4000 V2 get in touch with the team at AusOptic. This year we've continued to expand our range with new partnerships that add and expand our existing portfolio of premiere equipment and optical technology manufacturers from around the world - all backed by our local AusOptic support team. Don't hesitate to contact our office if you need a hand arranging in-depth demonstrations, or to discuss your specific applications with our partners engineers. Comparing the different QSFP28 variants, depending on your cabling and application. To make it easier FLEXOPTIX created an overview with all the different variants, without Active-Optical-Cables and Direct-Attached-Cables. The main difference between Q.161HG.x and Q.85/131HG.x is the connector type. QSFP28 like Q.161HG.x do have an integrated LAN-WDM Mux/Demux which multiplexes all 4 lanes to only one fiber. The same for Q.161HG.x.C/CL but with CWDM Mux/Demux. This gives the ability to use a LC-Duplex connector with a standard Multimode- or Singlemode-Fiber. 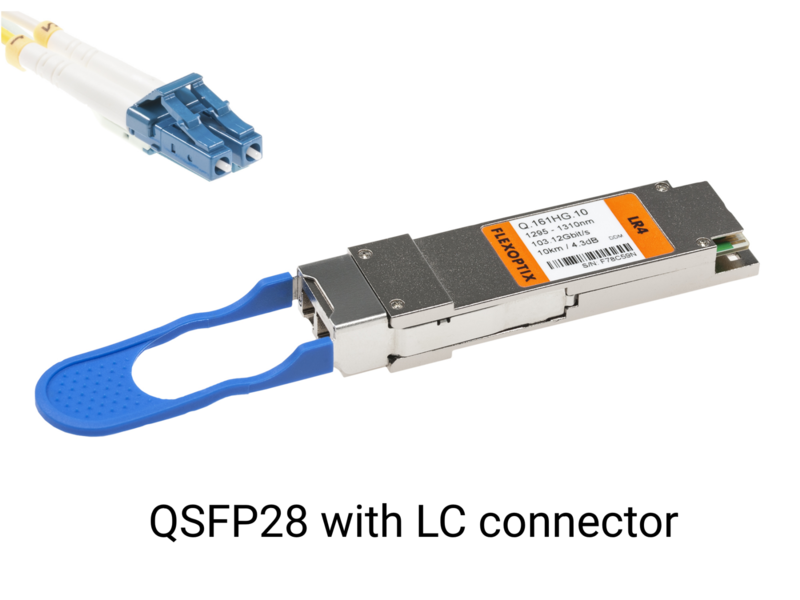 QSFP28 with MTP/MPO connector are more price sensitive. There is just a cabling with MTP/MPO cables needed. Note: a QSFP28 LR4 is interoperable with a QSFP28 LR4. I didn't mention this in the columen "interoperability" for a better overview. This applies to all other types as well. From a technical point of view a "split operation" is possible with all QSFP28 mentioned above. QSFP28 get always 4 x 25G/28G from the host on the electrical side. Only the programming of the transceiver needs to be adapted for the host. On the optical path you have to check how to split up the signal in 4 dedicated 25G/28G lines. For the ones with MTP/MPO receptacle this is not a problem with breakout-cables. 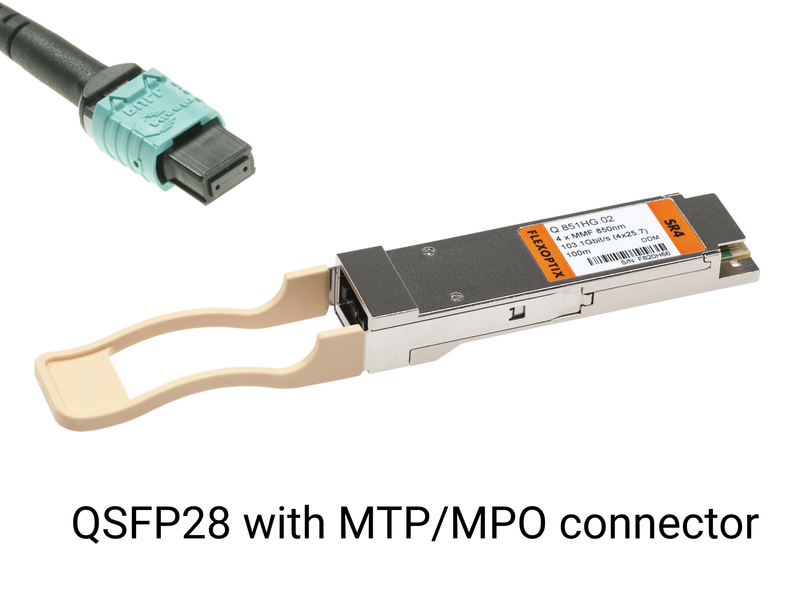 For connecting to SFP28 please have a look on the available SFP28 transceivers. The easiest way to manage and deploy SFP transceivers across vendor hardware brands. Maximise the capacity of your existing network and reduce inventory with reprogrammable optical transceivers. Developed in Germany, the fully-featured Universal Transceiver range brings powerful upgrade options to your existing network. From the latest 100G formats, to long distance modules reaching past 140km, industrial, and legacy system requirements. The FLEXBOX is a rugged, palm-sized, USB device that allows you to reconfigure FLEXOPTIX Universal Transceivers on-demand, right from your laptop or Android device, ready to be deployed across multiple equipment brands in seconds. The FLEXBOX transceiver programming function only works with FLEXOPTIX Universal Transceivers. It won't reprogram generic SFP transceivers. Using FLEXOPTIX Universal Transceivers together with the FLEXBOX lets you radically reduce the quantity of spares you keep stocked on the shelf. It also opens up innovative technologies like wavelength-tuneable DWDM modules that simplify DWDM deployments - read more in our DWDM solutions spotlight here. The FLEXBOX also speeds up your response time in the field, putting powerful management functionality right your hand with instant diagnostics from the built in Optical Power Meter and Light Source for troubleshooting. Airports around the world are in the process of upgrading their network infrastructure to support the growing demands for both Wi-Fi access and video surveillance. To overcome the distance limitation of copper cabling, fiber optic cabling is routed to terminals, concourses, parking structures and runways where Wi-Fi access points and cameras are located. Since most of the devices are not conveniently located near power sources, Wi-Fi access points and cameras with Power over Ethernet (PoE) are installed. The challenge is to deploy a compact and cost-effective solution that enables the powering of hundreds of PoE devices across a fiber optic wide area network and supports extended temperatures for outdoor installations. To meet the demands of travelers, airports have started offering free Wi-Fi with increased speeds. This can require the entire wireless infrastructure to be redesigned and upgraded. A large International Airport in the Southeast is now on the growing list of major international airports to offer customers free Wi-Fi. The entire airport has become a huge wireless hot spot, allowing nearly 100 million passengers per year access to Internet service from virtually any point. The City Department of Aviation was responsible for the design and deployment of the Wi-Fi network at the airport. They worked with a large system integrator on the project to install over 300 Wi-Fi access points throughout the 6.8 million square foot terminal complex. Fiber was distributed from the central internet Point of Presence at the network core to Intermediate Distribution Frames (IDF), or electrical network closets, throughout the airport. A PoE switch was installed in each IDF, and multiple Wi-Fi access points were connected to each switch. Each concourse has four IDFs, where gigabit network links were distributed from PoE switches in a hub and spoke topology. Depending on the location in the concourse, about half of the switches required a chassis of media converters to enable fiber connectivity to the access points. They selected Omnitron Systems’ iConverter media converters to provide high-density fiber distribution from the switches. iConverter gigabit media converters were installed in a 19-module chassis along with an SNMP management module. Up to 18 gigabit fiber runs were distributed from each switch to the access points. The access points required 30 watts of Power over Ethernet (PoE+), and due to the high volume of access points deployed throughout the airport, they needed a cost-effective and compact solution to convert the fiber to copper, and provide PoE+ power. At the end of each fiber run, the City Department of Aviation installed OmniConverter PoE media converters to convert the fiber to copper, and provide PoE+ power to one or two wireless access points. The OmniConverters provided the gigabit copper to fiber conversion, and eliminated the need for a mid-span device, or for the Airport to install expensive AC power outlets near each camera. They installed the OmniConverter media converters close to the access points to simplify troubleshooting, although the access points could be located up to 300 feet away from the OmniConverter media converters. One of the many reasons the OmniConverter was selected for the project is the ability to remotely reboot the wireless access point without physically accessing the device. The configurable PoE Power Reset function on the OmniConverter PoE media converters enables the access point to be remotely reset by disconnecting the fiber optic cable at the IDF. When a problem with an access point is identified, the fiber port at the IDF can be shut down or disconnected. The OmniConverter disables power for 2 seconds when a loss of receive fiber link is detected, and the access point is rebooted. This eliminated the need to send a tech with a ladder up to the ceiling to power cycle the access point. Historically, video surveillance is used by the TSA, airport security and U.S. Customs and Border Protection to ensure the safety and security of the public at airports. Video surveillance now covers the entire airport, from parking lots to the perimeter, and from the terminals to baggage claim. A similar concept used to deploy the Wi-Fi network was employed to connect the PoE IP surveillance cameras. Fiber cabling from the security office at the network core connected to Intermediate Distribution Frames where network PoE switches were deployed. iConverter gigabit media converters were installed at each IDF to provide high-density fiber distribution from the switches to the cameras. The video surveillance was a little more challenging to deploy than the wireless network because there were fewer IDFs outside the concourse, and a more extensive area needed to be covered. OmniConverter PoE media converters with two fiber ports were deployed, allowing the airport to daisy-chain the converters over longer distances in the parking lots. Another challenge was that many of the cameras were located outdoors and required hardened network equipment. OmniConverter copper-to-fiber gigabit media converters were placed across the airport facility in convenient locations near power outlets. Several daisy-chain fiber links were run to light poles in the parking lots that provided excellent camera locations and power for the temperature hardened OmniConverter PoE media converters installed in NEMA enclosures. Each OmniConverter powered one or two PoE+ cameras, and in some locations, two HPoE 60 watt cameras. After the installation of the video surveillance network, the entire airport was being monitored from a central location. The daisy-chain topology allowed long distances to be covered and preserved fiber optic cabling. Since the network covered such a large area, the PoE Power Reset feature on the OmniConverters eliminated the need for the airport to send out personnel to physically reset the equipment. Omnitron’s OmniConverter PoE media converters provided a compact and cost-effective commercial and temperature hardened solution that enabled the airport to extend distances to PoE devices with fiber. 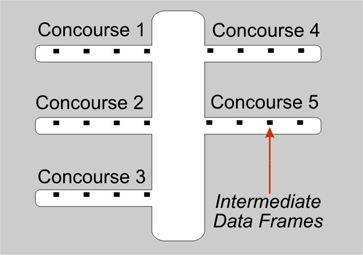 The variety of port configurations available in the OmniConverter product family provided the flexibility for the airport to connect the devices in point-to-point or daisy-chain topologies. Regardless of the powering requirements of the wireless access points or cameras, the OmniConverter has the ability to power PoE, PoE+ and HPoE devices, eliminating the need to purchase or stock multiple PoE devices. FLEXOPTIX Universal Tuneable SFP+, XFP, and CFP Modules give DWDM network operators a flexible new solution for DWDM deployments without the OPEX overheads of fixed-wavelength modules. With tuneable DWDM transceivers you can radically reduce OPEX and streamline your inventory of spare parts and stock. DWDM networks are usually set up with fixed DWDM transceivers. This means that the laser hardware has a fixed wavelength for transmitting over a DWDM channel. But if one channel fails you need this specific channel in your spare part stock. Typically DWDM is used with 40 channels. So you need to stock 40x different wavelengths. With tuneable DWDM transceivers those 40x redundant modules can be covered by just 10x modules, radically reducing the cost and quantity of stock you keep on hand. In more complicated DWDM networks, you need to do a wavelength planning for ordering the right types. So there needs to be a documentation which specific channel is already in use at different locations. By using tuneable modules you just need to count the unused DWDM ports instead of each wavelengths and order the needed amount of only this one product. This reduces a lot of complexity and makes the planning so much easier. You can use the FLEXOPTIX Universal Tuneable DWDM Transceivers in more than 150 host systems (see the full list of supported network equipment brands here). You can use the FLEXBOX transceiver programmer to configure them on your own, or just order the modules pre-configured. Don't worry if your hardware doesn't support the tuning capability. With our FLEXBOX transceiver programmer you can persistently reconfigure the wavelengths, it even stays after unplugging/reboot/power off. Thus you can now easily build a light source that is adjustable over the whole C-Band. Beginning from 1528nm (196,15 THz) up to 1568nm (191,1THz). In other words: ITU channel C11 to C60 at 10Gigabit with 23dB (+/- 80km) power budget! While FLEXOPTIX has been building tuneable XFP modules since 2010, it took a couple of years to introduce the same tuning capability to our SFP+ range. Highly requested, the main barrier was cutting down the power consumption of tuneable SFP+ modules to fit within the industry-standard MSA specifications. SFP+ modules have very low power consumption in comparison to the XFP MSA, which has defined Power Levels up to Level 4 (greater than 3.5 W). Resultant from this low power consumption, the biggest technical difference between tuneable XFP modules and tuneable SFP+ modules was CDR functionality (Clock-Data-Recovery). The standard specification for XFP includes CDR, the SFP+ standard does not. Sure there are some SFP+ on the market with CDR, but these already operate at the full Power Level II, which left no additional overhead for tuning capability. Now, 5 years after launching the first tuneable XFP modules, we're proud to offer FLEXOPTIX Universal Tunable DWDM SFP+ modules complete with full CDR and xWDM tuning capability at Power Level II. This achievement guarantees that this device will work in all switches operating with the standard Power Levels specified in the MSA. FLEXOPTIX Universal Tuneable DWDM Transceivers, including XFP, SFP+ and CFP modules are available here. Get in touch with the team at AusOptic for advice on your specific requirements. The new A-Series WaveShaper family offers for most models significantly improved optical specifications, as well as an Ethernet interface with RESTful API for remote configuration and control, and an in-built web-server to allow control from any web browser. The new A-Series WaveShaper family contains all capabilities of the previous generation WaveShaper instruments. It provides a range of programmable optical filtering and switching solutions for optical R&D and production test applications. Based on Finisar's high resolution, solid-state Liquid Crystal on Silicon (LCoS) optical engine, the WaveShaper family delivers extremely fine control of filter characteristics including centre wavelength, bandwidth, shape and, for WaveShaper 1000, 4000 and 16000, dispersion and attenuation. The WaveShaper A Series instruments include a Web service API which enables the user to remotely configure the device over an Ethernet connection using HTTP commands from any software programming language. In addition, a DLL package is available for Windows-based PCs ensuring full backward compatibility (“drop-in replacement”) with previous generation WaveShaper units. The WaveAnalyzer High Resolution Optical Spectrum Analyser allows picometer resolution spectral analysis in combination with a real-time measurement update rate of up to 10 Hz. WaveShaper - How does it work? The WaveShaper family is based on Finisar’s Liquid Crystal on Silicon (LCoS) technology. As shown schematically in the figure below, the input signal is dispersed by a conventional grating before its spectral components hit the LCoS optical processor. This LCoS processor consists of a matrix of reflective liquid crystal elements. By applying voltages to these matrix elements, they can add individual phase shifts to the reflected signals which allows beam steering of the signal components hitting the LCoS processor. As the wavelengths are separated on the LCoS chip the control of each wavelength is independent of all others and can be switched or filtered without interfering with other wavelengths. As a result, the structure offers spectral attenuation, dispersion and optical switching capabilities which are available in the WaveShaper family. Dimension develop and manufacture visual measurement instruments such as automatic Fiber Endface Interferometers and Fiber Endface Inspectors. FiberLabs Inc. develop optical amplifiers and test equipment for optical fiber communication, optical sensing, bio-medical optics and more. FiberLabs provide Optical Amplifiers, ASE Sources, Fiber Lasers, O-Band Filter, LEDs, and Specialty Fiber covering the widest wavelength ranges available, including S, C, L, and O-Bands plus 1um, 2um, and 850nm. iXblue Photonics helps photonics engineers to get the most out of the light by providing high performance, innovative and reliable photonic solutions. iXblue offer specialty fibers, Bragg gratings and optical modulation solutions for a variety of applications including optical communications, fiber lasers and amplifiers, photonic sensors, space and sciences. Luna specializes in advanced fiber-optic testing and measurement. Its award-winning product line includes optical analyzers, ultra-high resolution reflectometers, and distributed temperature and strain analysis tools for optical fiber components, modules and networks. NTT Advanced Technology Corporation is a technology integrator that commercialises the research results of NTT R&D Laboratories. At the exhibition NTT-AT will be exhibiting Optical Connector Cleaner, Optical Connector Polisher, Polyimide Waveplate, and more. Ultra Tec manufactures Bare-Fiber Polishing Machines, Portable Connector Polishers, Production Polishers, Cut-off Saws and Polishing Supplies. Applications include, Contacts, Termini, Connectors, Waveguides, Lenses, Capillaries, Small Optics, Crystals, Micro-chips and other Electro-Optic Devices. We also stock a wide variety of Polishing Supplies. New for 2017 is the FiberLab software-driven Bare Fiber inspection microscope. With a history spanning 50 years, Zeus Industrial Products, Inc. have grown into a global leader for polymer extrusion technologies, partnering with industry front-runners to bring advanced polymer solutions to the world. Today Zeus produces tubing, heat shrink and coating products for fiber optics in medical, energy, automotive, and aerospace industries. Zeus sheathing and furcation tubing protects and extends the life of sensitive optical fibers. New from Omnitron-Systems, the 6-port OmniConverter GPoE+/SX converts 10/100/1000BASE-T copper to 1000BASE-X or 100BASE-X fiber, and injects Power-over-Ethernet. GPoE+/SX PoE media converters provide network distance extension with fiber cabling, and function as PoE injectors for up to four Powered Device (PDs) over standard UTP cables that carry the Ethernet data. Models with two fiber ports support redundant fiber uplinks for critical applications that require protection and sub 50ms restoration in the event of a fiber failure. The second fiber port may also be used to cascade multiple media converters, or it may be used as another switch port. Configurable features include Directed Switch Mode, MUX Mode, Dual PoE Device Mode and a PoE power reset. In this application diagram, OmniConverter PoE injector media converters are deployed to overcome the distance limitation of UTP copper cabling by enabling fiber connectivity to PoE powered IP surveillance cameras and Wi-Fi access points. Gigabit fiber is distributed from a Ethernet switch at the network hub location. OmniConverter GPoE+/SX media converters provide fiber connectivity and PoE power to two IP surveillance cameras and two access points at each location. The dual fiber ports enable a fiber daisy chain architecture that connects multiple surveillance locations. One port is the fiber uplink, and the other port is the fiber downlink to the next OmniConverter. Daisy chains are useful when deploying multiple PoE or PoE+ devices in a linear fashion along city streets, highways, rail lines, border fences, or pipelines. PacketLight Networks presents PL-2000AD, a fully integrated Optical Transport Network (OTN) solution that equips enterprises and carriers with extended point-to-point Layer-1 encryption. New from PacketLight, the PL-2000AD is a fully integrated (compact 1U) Optical Transport Network (OTN) solution that equips enterprises and carriers with extended point-to-point Layer-1 encryption capabilities across metro and long haul routes. The PL-2000AD protects data in transit at the physical layer, where the risk of a dangerous security breach is increasing exponentially.